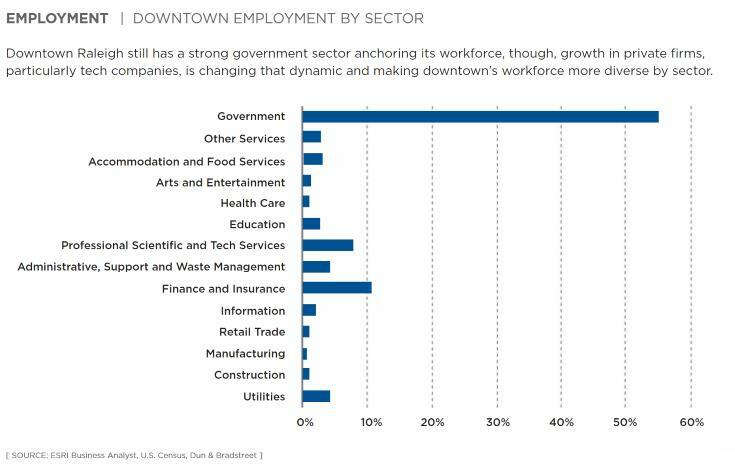 Here’s a quick one as I glance through the 2015 State of Downtown Raleigh report. Click for a larger view. I’d love to see this exact table broken out into two smaller tables, north of the State Capitol and south of the State Capitol. It would be interesting to see how the government jobs break down into those categories? They’ll do anything for a buck. I’m sure that one of their buddies wants to buy that land and develop it. Or, perhaps, they want to locate a new state police force to stop moral mondays? Or, perhaps, they want to State’s Republican Party HQ between the Capitol and the Legislative building? Or, perhaps, they want to relocate the Westboro Baptist Church from Kansas to NC? The mind boggles at what’s coming next out of Jones Street. If they do want to build a new building for the Museum of History… I would want it located at the intersection of E Jones Street and N person Street. This would place it close to the Governors Mansion which is a big part of NC history to say the least. I would want it several stories tall… with retail on the bottom floors…etc! Then Perhaps CAM can take over the old building… opening up a great property in the warehouse district for a developer. So here’s the thing. The city wants very much for more people who work downtown to also live downtown, in order to keep life in the area 24/7 but to also lower the amount of traffic. People walking to work, taking the R-Line, etc. So here’s the disconnect folks—the largest employer in downtown Raleigh is still goverment. (Mostly state but also city, county and federal.) And how many government workers are paid enough to buy/rent most of the housing that downtown Raleigh has these days?? I tell you from experience: hardly any! The vast majority of government employees downtown—particularly the state employees—commute in from cheaper areas like Knightdale, Garner, Fuquay or Johnston County. Very very very few live ITB. The costs of housing in downtown Raleigh really need to be taken a hard look at, by our city leaders. This isn’t helping the traffic & parking situation in downtown—it will more likely make it worse.